The latest article in the Upstate NY Stargazing series, “Upstate NY Stargazing in May: A Meteor Shower and Preparations for the Solar Eclipse,” has just been posted to newyorkupstate.com and syracuse.com. * With only four articles to go before the great total solar eclipse on August 21st of this year, we’ve shifted gears in the article opener from great nighttime observing to great daytime observing. You’ll be seeing more and more from all kinds of news sources as the data approaches, and CNYO is figuring out what we plan to do for the event (besides a few scheduled eclipses lectures in the CNY area in the weeks before). For the record, amateur astronomers reserved their rooms years and years ago in all the best places – if you’ve not figured out your flight plans around the 21st already, there is a seriously good chance that you’ll be stick driving to see the best view of totality. 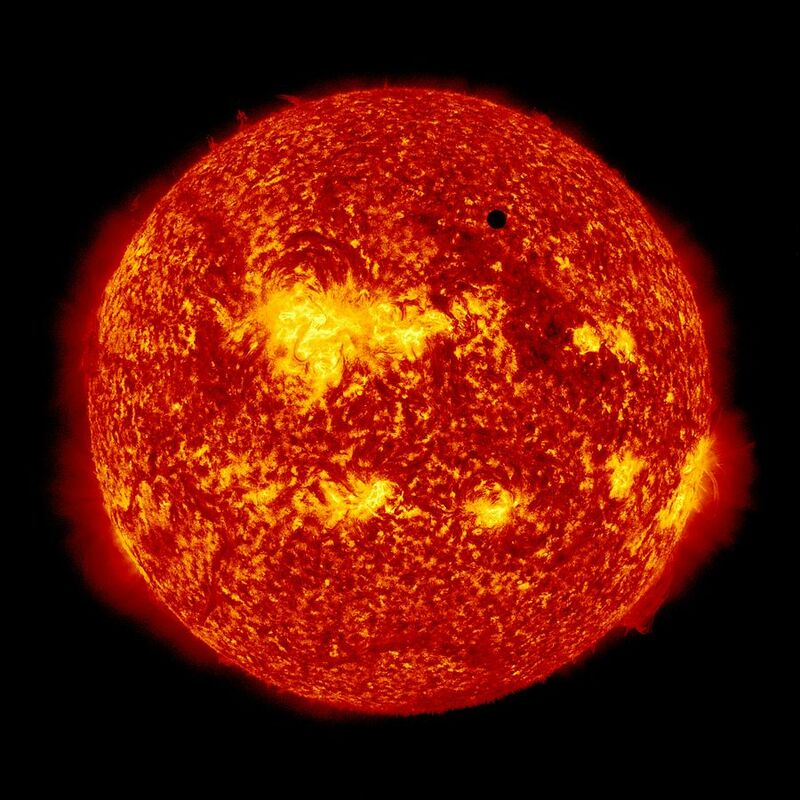 Caption: The transit of Venus across the Sun on June 5/6, 2012. By NASA/SDO, AIA. 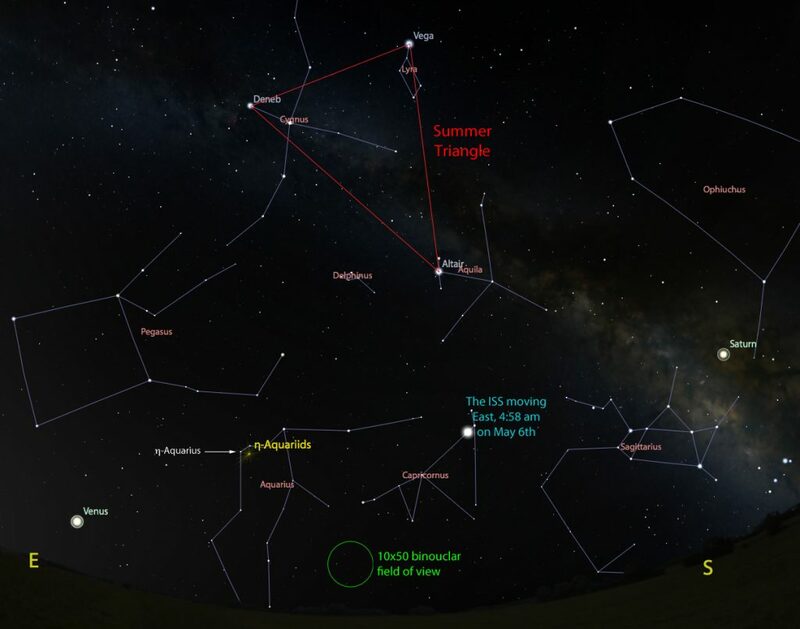 * We continue our look north with Cassiopeia, the third of six constellations that are always visible in the nighttime sky from our latitude (readers then can guess where the next three articles are headed). * This month, we await the Eta Aquariid (or Eta Aquarid, or eta Aquarid… Halley’s Comet doesn’t care what you call it) Meteor Shower, which peaks on the early mornings of May 5/6. In doing the homework for the article, I found it interesting to note that we’re not entirely sure that this meteor shower originates from particles attributable to Halley’s Comet, the object we most associate with this shower. It is possible that Halley’s Comet is indirectly responsible for the particles by being directly responsible for the redirection of the debris from a different object in to the current Eta Aquariid path. Caption: The Eta Aquariid radiant, complete with Venus, Saturn, the newly returned Summer Triangle, and one perfectly-placed 5 a.m. ISS flyover on the morning of May 6. Image made with Stellarium. Click for a larger view.